Good evening everyone . Yesterday wee rolled over 1.5 million actual career Mikes on the big road. 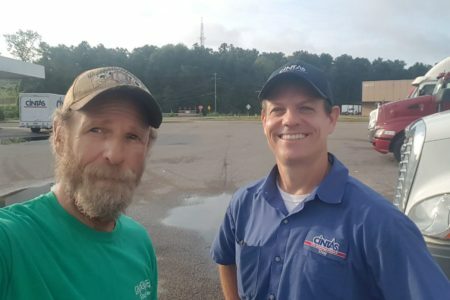 This morning I got to meet up with yet another Road Crew member. Trey from Hattiesburg, Mississippi has been following BigRigTravels since 2008! His photo has been added to the official road crew gallery. Long tight trip wee have been on this time since we had to stop short due to our 70 hour limit every single day . Great miles for sure though! Tomorrow morning we will make the final delivery and take about 24 hours off to regain some hours that will enable us to accomplish the next trip . I will arrive early of course and inquire about loading us a full day early, but we will see how it goes.